Once a traditional craft practiced by village women, Palestinian embroidery, "tatreez", has become an important symbol of Palestinian culture. Embroidered pieces can be found in the homes of most Palestinian families. The popularity of embroidery springs both from its beauty and its association with Palestinian culture and history, which dates back to more than 5000 years ago. Made with tiny cross-stitch on finely meshed canvas, the handmade tapestry consists of small squares that contain geometric patterns or stylized plant forms. Several squares make up a single pattern block. 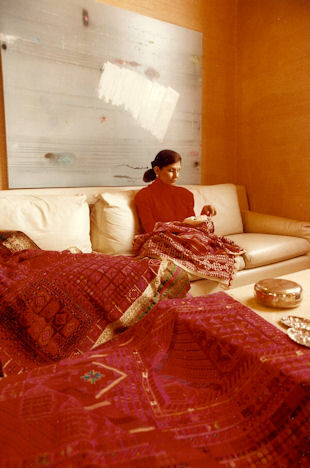 Embroidery was the principal decoration of rural Palestinian women's clothing. It was part of a village woman's daily routine and a means of showing her personal skills and social identity. The various colors, patterns and styles of a dress reflected a woman's social standing, marital status and wealth. The designs, unique to each village, have been passed down from mother to daughter over the generations. As a young girl, Jumana learned this art from her mother.